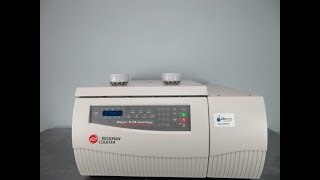 The Beckman Allegra X-12R Refrigerated Centrifuge provides reliable temperature control, ease of use and high speeds ideal for cellular research. This tabletop centrifuge is great for applications such as harvesting cells, general separation and separating blood components to be used for research. The Allegra X-12R Centrifuge Benchtop by Beckman allows you to confidently eye balance your samples, and identifies rotors automatically saving you time and helping to speed your workflow. This 3L refrigerated centrifuge uses a brushless induction drive for years of dependable use. The microprocessor control of this benchtop centrifuge includes a numerical key pad for entry letting you select from 20 user-defined programs, time options, 10 independent acceleration profiles and 11 independent deceleration profiles, and set up your run by rpm and RCF through user friendly prompts. The Allegra X-12R has a temperature range between -10°C to 40°C and holds temperatures for up to 10 minutes after a run has completed. This Beckman Allegra X-12R Refrigrated Centrifuge has been fully inspected and is performing without issue. All of our lab equipment comes backed with our standard warranty. Should you have any questions, please don't hesitate to contact us.